QLA supports the development of small business opportunities for its target group. An example of this is the story of Lue Han. QLA helped Mr Lue Han to further develop his business. Lue is a UXO survivor. Already blind in one eye since childhood, he was injured in a UXO accident in 2005 when digging in his rice field and a piece of shrapnel totally blinded him. After his UXO accident, his wife received training in how to raise animals and they started raising pigs. 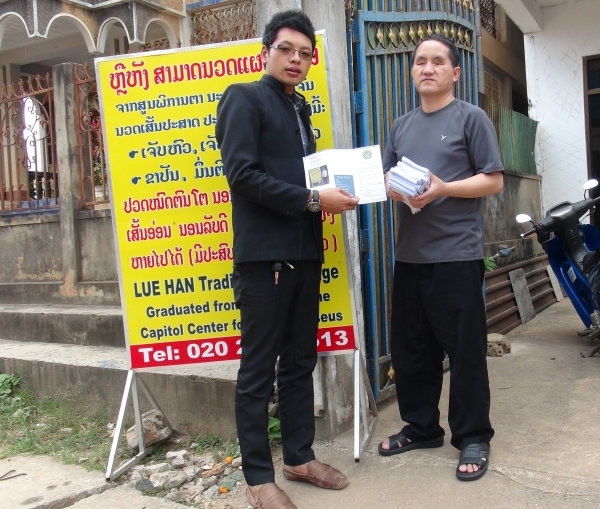 The income from that allowed them to go to Vientiane for Lue to attend training at the Centre for Blind Masseurs. He graduated in 2008. Lue feels proud of what he has accomplished and in 2014 QLA was happy to assist with the creation of a brochure and an external sign to help with the marketing of his business. If you need a traditional massage in Phonsavanh, please call Lue (or contact QLA if you need assistance with translation! ).